I have so many pictures from this weekend, I think I'm going to have to separate out the posts to keep everybody from being bored with 1 long post! The irony in seeing that was that I was. 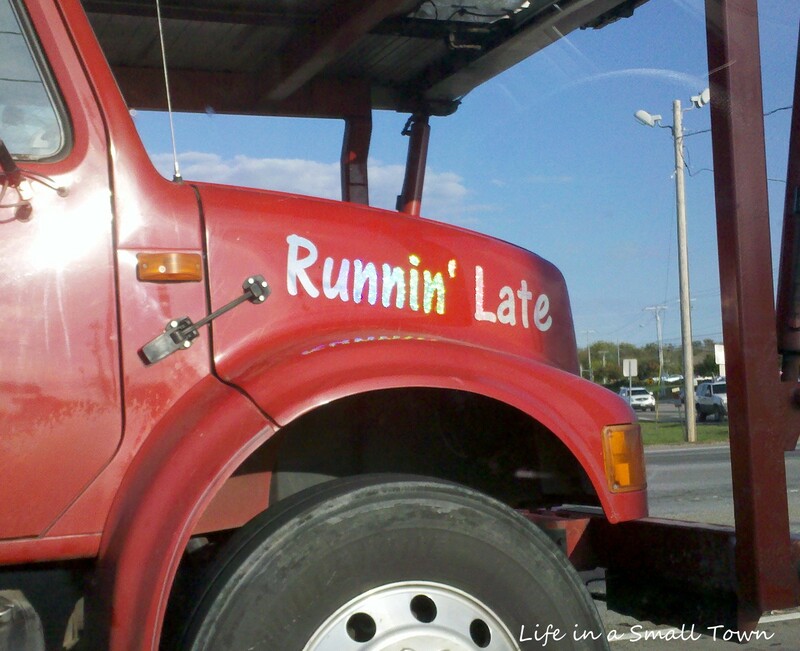 Runnin' late, that is. You would think that since I was on Fall Break I would've been there early! 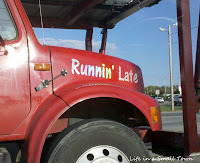 When I got there, though, our director was just getting there, too, so I wasn't the only one runnin' late! Friday, CH & I debated on whether or not we should drive 1 hour to the Small Town's football game. We knew it wasn't going to be a very good game, but we also realized that our chances of watching YS perform are very limited. So, we went. YS with his "game face" on. Before they performed, we saw this gander of geese fly over, but they weren't in a "V". CH said that their next formation would be a "T" (get it: for UT). We all know how shameless us bloggers are with pictures! I asked the cheerleader if I could take a picture of her pom-pom, and she said "sure" without even a funny look. Wonder if her mom blogs??? Here's a "not-so-great" picture of a water tower that you can see from the field that looks like a UFO when it's lit at night. Especially if you're driving on the interstate and see it! I took a video so you could see a typical YS in the stands during the game. I've had so many people stop me and tell me that they spend a lot of the game watching him instead of the game! He really is having a blast this year! Pom moms like myself are photo junkies. Our daughters are so used to photos nothing surprises them. We had pink poms like those too for October. And we would drive 2+ hours to go see her at the football games since it was her last year dancing. Luckily the team was pretty good. Love when kids get involved in supporting Cancer awareness!!! Looks like YS is having a blast! I'm so impressed, YS is amazing! You can see how much he loves it. Um...so YS had me doing a getting a little jiggy in my chair! LOL It's catchy, that's for sure! Love the video. My daughter was drum major when she was a senior in high school and absolutely loved it. I enjoyed going to the band competitions!! The band kids are very talented individuals. Go UT! That video was AWESOME!!! Love his sense of fun!!! !